This attractive, 22-story, red-brick apartment building was erected in 1955. It is a cooperative and has 89 units. 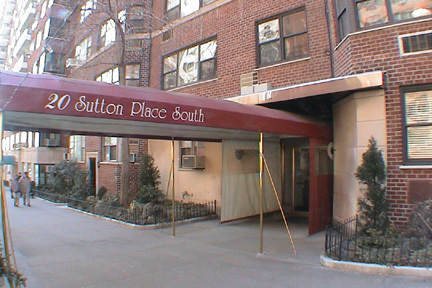 While not the most distinguished Sutton Place apartment building, it has a fine location in this very attractive, quiet and elegant community. Two parks overlooking the East River are nearby on Sutton Place and this building is one block south of the charming row of townhouses that share a large communal garden between 57th and 58th Street on the east side of Sutton Place. This building has a doorman, a canopied entrance with a marquee, sidewalk landscaping and consistent fenestration and some bay windows. It permits protruding air-conditioners and has no garage and no health club. It is not close to a subway, but there is very good cross-town bus service on 57th Street. There is an excellent supermarket that shares some of the vault space beneath the nearby Queensborough Bridge at 59th Street with a large restaurant.